In May we wrote how one of our sites is winding down and how we were partially decommissioning one of the two on-site treatment plants. Now in September, the load has continued to fall and we have completely turned off the second plant. The first plant is handling the remaining load nicely while the second is now being emptied and prepared for removal from site. The rest of the decommissioning process begins with normally processing as much remaining liquid until levels are too low to continue. 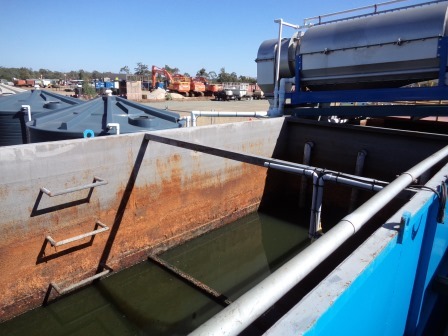 From here, we have taken the opportunity of using the still-running plant to receive some of the liquid and sludge; what we can’t get out with a submersible pump is sucked out with a vacuum truck. By this stage, the ‘liquid’ left is a viscous black sludge sitting at the bottom of the tanks. The truck delivers this to the nearest municipality STP which have the right equipment to deal with waste sludge. The next job will be disconnecting all the pipework and utilities, and then packing up and removing the plant. And then we’ll do it all again when the site shuts and the other remaining plant requires decommissioning- more news to come!